Categories > The Open Forum > My new book has been released! I am not one to toot my own horn, but my new book Dancing With the Cards was released yesterday. Liam Montier and Kaymar Magic have done a nice with the production. I understand it is selling quite well! I'm doing an initial release with Kaymar and then a broader distribution through other channels. As with my other books and my column in The Linking Ring, it is all (mostly) self-working magic. This time, however, all cards. I have a very long way to go to be as prolific and clever as Mr. Lorayne, but I know my writing style has benefited from all that I've learned reading Harry's stuff over the years! Happy to have been of help. Is it a "regular" book or an e-book? If it's a "regular" book, and if you send me one, I'll be glad to give you my thoughts about your "style." Get. This. Book. If, that is, you enjoy uncluttered, entertaining magic with plenty of built in humor and eye-popping effects. I haven’t had the book long enough to try any of the effects on the public-at-large, but I have performed the first two tricks, The Third Attribute and That Flippin’ Contest for my wife. She laughed, admitted her amazement, and promptly awarded the routine the Jaded Magician’s Wife’s Seal of Approval, so you just know it’s good. You just know it. Mike’s thinking is solid. His goal is to hit the spectators hard with streamlined methods focusing on the effect rather than knuckle-busting moves, but never at the expense of the magic or entertainment. He understands that it is the effect, the whole effect, and nothing but the effect that matters in the end. That and entertainment. In addition to the two tricks mentioned above – which flow seamlessly into a wonderful full-circle routine – I am also partial to My Favorite Things and My Birthday Card. But that’s not to say that the remainder of the effects aren’t worth your attention. You know how it is, we are all attracted to certain tricks over others whenever we read a magic book. As I wrote to Mike, any of the tricks in this book could easily be converted to one of those annoying $10.00 downloads and you would still think you had gotten a bargain. 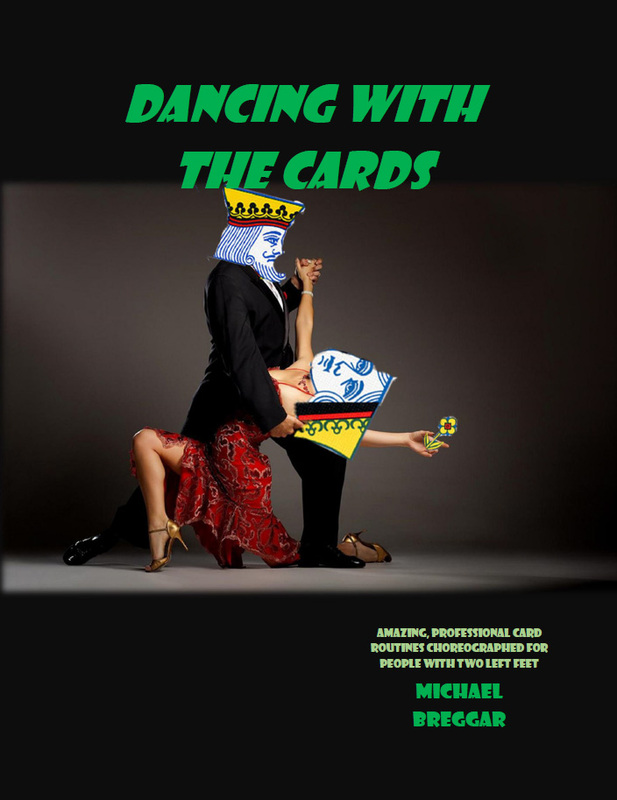 Mike kindly provided me with an advance copy of Dancing With the Cards, but made no demands in return. (Although I do hope he chooses to return my cat after seeing this positive review.) This little ol’ review is as sincere and reflects how I feel about the material in the book. Get yourself a copy. You won't be disappointed. OK... I’ll aend your cat back. You can have mine too. Thanks so much AV for your very kind words. They are much appreciated!! I'm also very impressed with this new title from Michael Breggar, and highly recommend it.